Don’t Get Trouble in Your Mind: The Carolina Chocolate Drops’ Story is a documentary portrait of the Carolina Chocolate Drops, an African-American string band from Raleigh, North Carolina, and their mentor, fiddler Joe Thompson (1919—2012). The film captures how three musicians from the hip-hop generation embraced a 19th Century genre and took it to new heights, winning a Grammy in 2010. The story of the band’s meteoric rise, from busking on the street to playing major festivals, is punctuated and informed by the history of the banjo’s origins in Africa and the untold story of how blacks and whites collaborated to create the earliest forms of American popular music. Filmmaker John Whitehead followed the band from their coming together through their breakup, making for an emotionally satisfying journey as well as a spectacular musical one. Stick around after the film for a discussion with director John Whitehead and journalist Jordannah Elizabeth. John Whitehead earns his living making documentaries for public television and videos for non-profit organizations. He is also a serious amateur musician with a long time interest in American roots music. His 2004 film, Make ‘Em Dance: The Hackberry Ramblers’ Story, traced the history of a legendary Cajun/country band from Lake Charles, Louisiana. 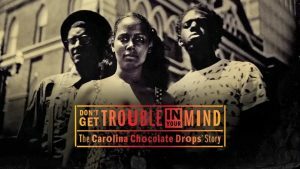 Don’t Get Trouble in Your Mind is his second foray into the roots music genre. He lives in Saint Paul, Minnesota with his wife, Suzanne Garfield. When not making movies he plays music with friends and with his band, Blue Yodel N0. 9.